The 33rd game of the season will witness Sunrisers Hyderabad facing Chennai Super Kings at the Rajiv Gandhi International Stadium on April 17. 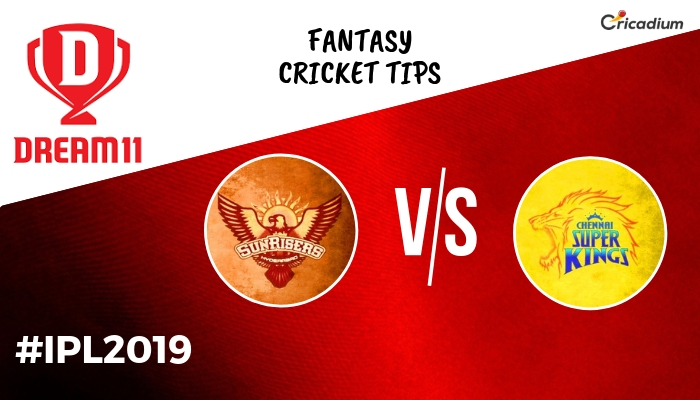 Keep reading to find out Dream 11 team prediction and Dream 11 fantasy cricket tips for the today IPL match 2019 SRH vs CSK. CSK, the defending champions as well as the table-toppers, have been in a superlative form this season. MS Dhoni‘s side has won 7 out of 8 games so far. On the other hand, SRH, after a good start, have lost 3 matches in a row. Check out the Today IPL match 2019 SRH vs CSK Dream 11 Prediction and Team. Jonny Bairstow has shown good form this season. Between him and MS Dhoni, it’s a tough choice for the wicketkeeper’s slot. Because Bairstow opens the innings and gets to face more number of deliveries, it’s better to pick him in the squad. Also, he is due for a big one and we feel he could be the captain of the side. The all-rounders may not be as effective as other teams. Hence, we have picked 5 batsmen. David Warner is a popular pick and so is Kane Williamson who has to find his form back. Vijay Shankar, who was picked in the Indian squad for the World Cup, could be a good choice as well. Both teams have some tremendous bowlers. Imran Tahir and Rashid Khan are world-class leg-spinners and both could be in the side simultaneously. As far as the pacers are concerned, Bhuvneshwar Kumar and Deepak Chahar have done well for their respective sides.